This article is about the bottom globe half that unlocks the Perplexing Pool. For the top half that unlocks the Awakening Wood, see Spherical Atlas. The Geographic Projection　(ジオグラフィックシステム?, lit. 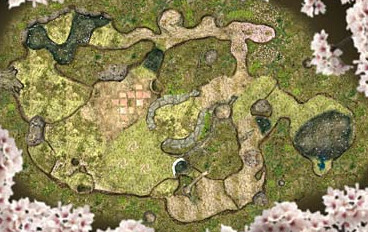 : "Geographic System") is a treasure in Pikmin 2. It is the southern hemisphere of a globe; this being a representation of Earth suggests that PNF-404 is Earth. Retrieving the treasure unlocks the Survey Chart, part of the Exploration Kit, which allows the Pikmin leaders to progress to the Perplexing Pool. This is because it contains data that holds coordinates that makes locating this new area possible. The Spherical Atlas is also a globe half, this time a northern hemisphere, and it too unlocks an area to land in (the Awakening Wood). The name is a reference to geographic projection, a way of mapping a sphere's surface onto a flat plane. The item is found in the same place as the Yellow Onion in the first game. This heavy treasure is found in the Awakening Wood, making it the only aboveground treasure that makes up the Explorer's Friend Series, and requires Purple Pikmin to be picked up, due to the fact that its weight is 101 and thus 100 weaker Pikmin cannot lift it. It is slightly buried and located near the longest constructible bridge in the area, behind a poison gate near the Hole of Beasts. A Creeping Chrysanthemum is nearby. See also: Spherical Atlas#Model and texture. 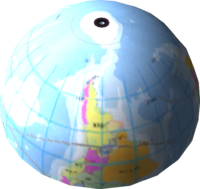 Just like the Spherical Atlas, this treasure's model was also changed in each region of the game such that the "front" of the model is a specific part of the globe. Unlike the Spherical Atlas however, these locations don't quite match the region of the game's copy. In the North American version, the "front" of the globe is South America, which makes sense. But in the Japanese version, it is also South America. Since there is no area related to Japan in the southern hemisphere, South America is as good a place as any other. In the European version, it shows Oceania, perhaps to highlight the fact that Australian players use the European version. The treasure as seen in the Treasure Hoard, in the Japanese/North American versions, and European version of the game, respectively. The camera was not moved since opening the Treasure Hoard entries. On top of that, it is worth noting that the texture for this model is actually flipped horizontally. This means that if one were to flip the treasure upright, Africa would be to the left of South America, which would be to the left of Europe. It is not known whether this is a mistake or if it was flipped on purpose, since the treasure is only ever seen upside-down and most people are used to the opposite orientation. Like the Spherical Atlas, the highlight texture is called hilight_I4_bombsarai, and is the same as the Careening Dirigibug's highlight texture. Also like the Spherical Atlas, this part of the globe is missing its pole, in this case, the South Pole. The Treasure Hoard icon for the Geographic Projection is also too low-resolution, making it hard to tell which region is being shown in it. “Fascinating! This object is highly similar to the one you found in the Valley of Repose. By examining this further, I may be able to extrapolate new planetary data! Decoding complete! As I surmised, this chip contains additional topographic data. The location of the Geographic Projection. The treasure in the Treasure Hoard. The Geographic Projection being analyzed. Texture used for the model. This article was a featured article from August 1st, 2017 to October 1st, 2017. This page was last edited on February 15, 2019, at 16:27.